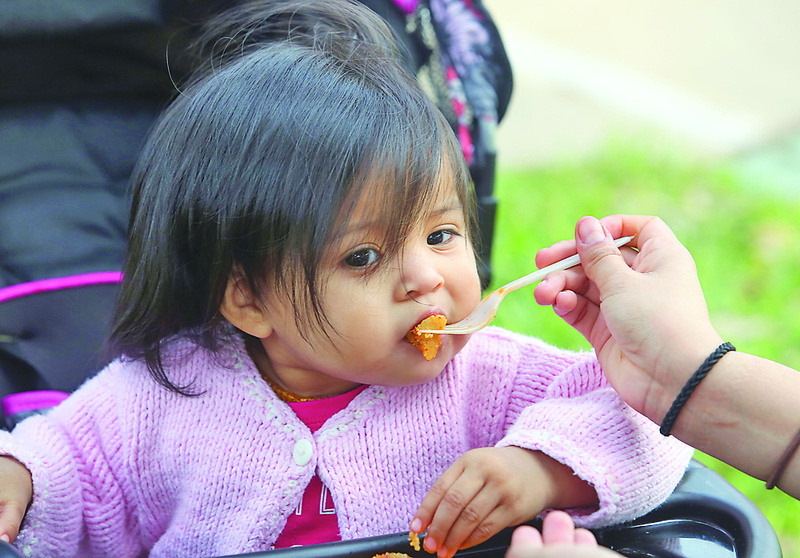 Joel Martinez | jmartinez@themonitor.com Alice Sauceda, 1, takes small bite of a tamale fed to her by her mother during Tamale Fest at Archer Park on Saturday in McAllen. The event has grown each year it’s been held. Included in the crowd were a lot of first-time visitors to the Tamale Fest. 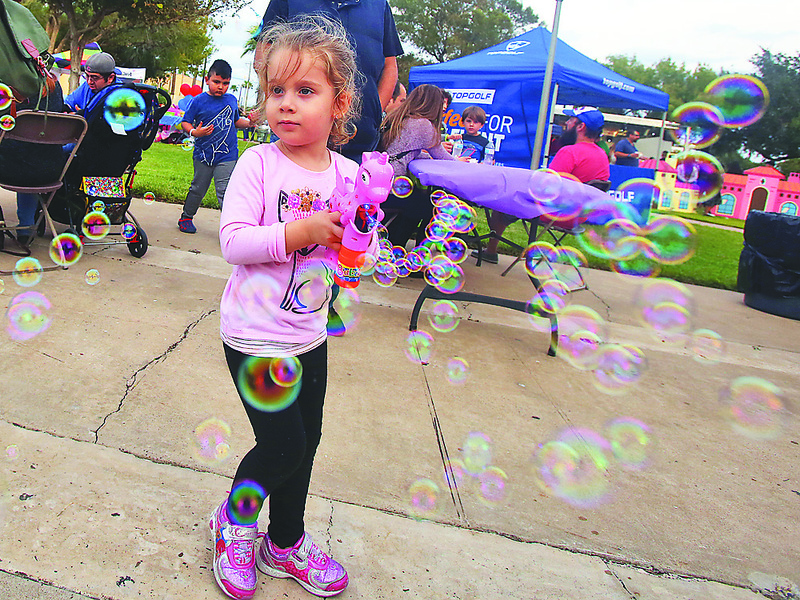 Joel Martinez | jmartinez@themonitor.com Sofia Castellanos, 3, plays with a toy bubblemaker during Tamale Fest at Archer Park on Saturday in McAllen. Joel Martinez | jmartinez@themonitor.com Fanny Rivera, from Delia's Tamales, prepares packages of assorted tamales for customers during Tamale Fest at Archer Park on Saturday in McAllen. His son, 12-year-old Aaron Flores, also attended the celebration. Children ran by in the park, dressed in traditional Mexican outfits, as parents sat at picnic tables, tasting the various dishes many food trucks had to offer. But as always, the main attraction remained the tamales. Elementary school children danced to the sound of music as festival-goers took part in the many activities that were offered. Many public and private Valley schools were well-represented at the Tamale Fest. The goal of the festival is to raise funds for the McAllen Boys & Girls Club and provide services to local needy school children. McAllen Boys & Girls Club spokesperson Yirla Gonzalez says the organization expected about 3,000 visitors at this year’s festival. That’s 1,000 more visitors than last year. A majority of visitors arrived at the festival in the early evening hours when the live entertainment began. This year, Valley Tejano singer Veronique Medrano headlined the evening entertainment and performed before a large crowd. The sky turned a little cloudy early during the event, but that didn’t deter local residents who vowed not to miss all the fun and games. “It got a little bit scary for a while but we’ve been looking at the weather. And sure enough, thankfully, everything turned out great,” Gonzalez said. Local amateur cooks offered their best version of the tasty Mexican treat. 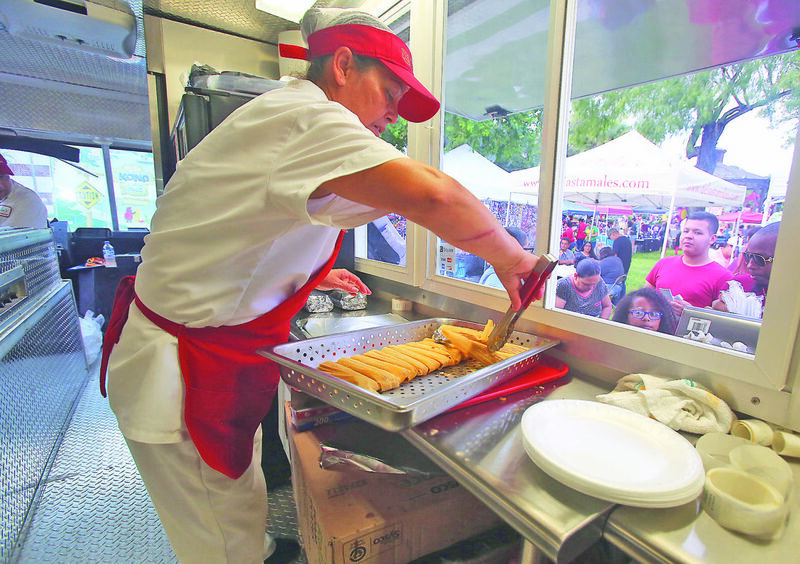 Winners were announced in three categories: chicken, pork and vegetarian tamales. The top prize was a $150 gift card in each category, along with bragging rights for the best-tasting tamales in the Rio Grande Valley. But the contest everyone was waiting for was the coveted tamale-eating contest. Last year, the winner downed more than 50 of the Mexican delicacies in less than five minutes. The rules are strict, and the competition even more fierce. This year’s contest resulted in a unique finish. Two contestants claimed the top prize. Carlos Teran and Edward Max, both of McAllen, each consumed 21 tamales in five minutes. “They showed great sportsmanship by sharing the winning title,” said Gonzalez. The nearest competitor ate only 15 tamales. According to Gonzalez, next year’s Tamale Fest promises to be even bigger and better.